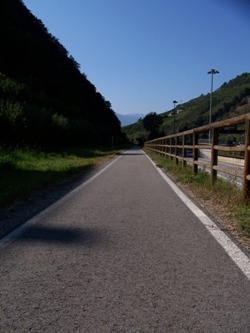 Join us on this unique ride of a lifetime tackling arguably the greatest piece of mountain asphalt on Italian soil before riding onto Eden and the spectacular shores of Lake Garda – it’s no wonder this ride is also known as “The Beauty and the Beast!”. The Stelvio pass begins gently but not for long, even in the lower slopes you’re pushing a mostly 7% gradient - before 10km you’re pushing 8-10% and that’s the easy bit! I haven’t mentioned the switchbacks – all 48 of them! each one rising you around and pushing you up by a further 5-8% on what at times looks like a sheer rock face. Sometimes you catch a profile of what’s to come and your first thought will be “that’s not possible” but as you will soon learn - it is and that’s your destiny! The altitude markers at first are a novelty but by the time you reach the 2000m marker it’s likely you can’t see beyond your front wheel as you focus on the square foot of tarmac in front of you. But make sure you’ve saved something for the final few km as the giant has a surprise waiting for you – the infamous Trafoi windings – the scene of great Giro battles – the final zig-zags to the summit will hurt but you can almost hear the distant cheers of spectators looking down on you willing you on to the finish and glory – well in your head anyway. After our well deserved nights sleep on the summit we have the small matter of descending the Stelvio – check your brakes, as you’re going to need them – a lot! 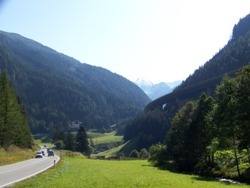 Soon we’re in Bormio and then we begin our climb of the day – The Gavia. Another ‘Hors catégorie’ and another monster. Again approached with respect and paced carefully you will be victorious – the summit offers nothing more than a small sanctuary building but you will be greeted like a legend – the hot chocolates pretty good too. Today is big – really big and you will need to muster all the strength you have for the three climbs today but once at Madonna di Campiglio you can begin to rest and relax in the knowledge tomorrow is all down hill (well nearly). From Madonna di Campiglio we make the ride through more exquisite mountain scenery before arriving at shores of Lake Garda. We ride almost the full length of this stunning lake but before arriving at our hotel in Garda we just have time for a quick dip in the crystal waters and then onwards to a great evening and celebrations. On booking this adventure you are signing up for the ride, the leadership, and the support of an experienced and helpful crew - who will endeavour to lead you safely, and reliably through Europe. You will have an experienced mechanic, and an experienced cycling leader, as well as an experienced support driver. We will be in simple hotels throughout the event (including buffet breakfasts). The standard of accommodation will fluctuate throughout the trip - but is designed to be functional - and to enable us to get a good night's sleep - and continue with the challenge. You will be sharing in twins or triples. If you require a single room then please request this at time of booking (a small supplement will be payable). Upgrades are also available for an extra charge if required. 3 nights hotel accommodation en route. Personal transfers to airport on final day (taxi ride required). Generally we can expect mild, warm and sunny weather. Equally however, we can expect a dramatic temperature drop and cool conditions on the Stelvio - this will be more relevant for the morning descent! Please remember to bring layers - not thick coverings.